Less than two weeks after the release of the Apple TV 4.2 software update, based on iOS 4.3, Apple has issued a minor 4.2.1 update addressing issues with flickering, waking from sleep, and audio output. The highlighted changes are detailed in Apple's support document covering Apple TV software updates. - TV compatibility: Addresses issues that may cause the screen to flicker or display incorrect color on some older TVs. - Wake from sleep: Addresses an issue where Apple TV may not wake up from sleep. - Audio: Addresses an issue where audio may not be heard on some TV models after switching from another input. 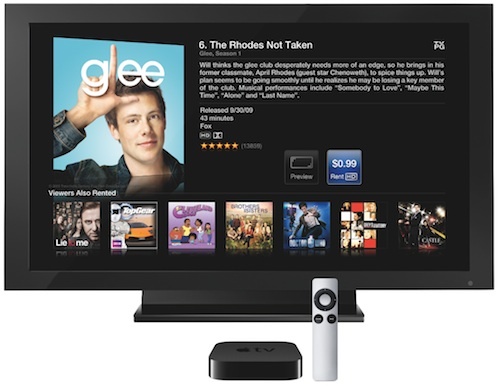 - Stability and performance: Apple TV Software Update 4.2.1 includes stability and performance fixes for Apple TV. While the Apple TV 4.2 software update brought MLB.tv and NBA League Pass video streaming along with other improvements, some users were experiencing flickering issues on televisions that were attempting to convert the Apple TV's 720p output to 1080i format. Apple last week promised that a software update to address the issue would be forthcoming.